buffalosabresnow: Which Sabres players like the bright lights of National Television? Which Sabres players like the bright lights of National Television? The Buffalo Sabres hit the ice tonight for the first of seven nationally televised games this year. Two years ago, after coming out of the tank, NBC had them scheduled for five games on their networks and last season they were on for eight, which means that the network's confidence in Buffalo was growing. 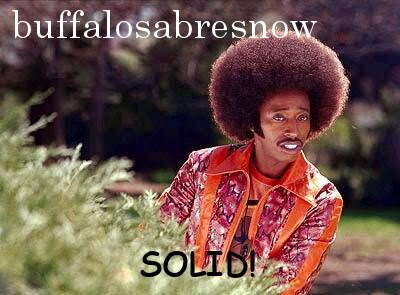 Apparently NBC is not convinced that the Sabres would take a step forward this season and as of right now, their reservations are warranted as Buffalo heads into tonight's matchup at home against the Detroit Red Wings with a 2-5-2 record. 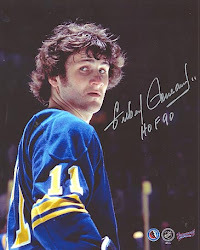 So seven games seems appropriate, although the Sabres will appear in the 10th anniversary of the Winter Classic, the brainchild of then team president Larry Quinn. The first "Classic" was on January 1, 2008 at then named Ralph Wilson Stadium against the Pittsburgh Penguins. This year the Sabres travel to the Big Apple to take on the NY Rangers at Citi Field, home of the NY Mets. And in a head-scratching move, Buffalo will be the "home team." Over the last two seasons, under then coach Dan Bylsma, the Sabres finished with an overall record of 4-5-4 in games that were scheduled to be televised nationally. That includes a March 1, 2016 matchup featuring the two prizes of the 2015 NHL Draft--Edmonton's Connor McDavid and Buffalo's Jack Eichel. It was included in the overall record despite the fact that NBC switched to a Washington Capitals/Pittsburgh Penguins matchup, as if the hockey world hadn't seen enough of the battle between Washington's Alex Ovechkin and Pittsburgh's Sidney Crosby. Although the Oilers/Sabres matchup left much to be desired, NBC missed a golden opportunity to showcase the first-ever matchup between McDavid and Eichel, the duo formerly known as "McEichel" with McDavid scoring both Edmonton goals, the second in overtime of a 2-1 Oilers victory. Then again, Bylsma himself didn't grasp the significance of the moment as he trotted out Johan Larsson and his line to take the opening faceoff against McDavid and his line leaving fans scratching their heads. This is rather significant as we know that the Sabres relied heavily upon their first-ranked powerplay last season as did some individuals as well. Over the course of the last two seasons on NBC Eichel lead all Sabres players with 12 points (6+6) and in an interesting twist, five of his six goals came on the powerplay while five of his six assists came at even strength. That propensity for setting up his linemates 5v5 helped Zemgus Girgensons become second on the team with four goals in the national spotlight. Eichel set up Girgensons twice in a 1:13 span in New York vs. the Rangers. Matt Moulson turned into a powerplay specialist over the course of the last two seasons, as two of his three goals and two of his three assists on NBC came on the powerplay during that span. Rasmus Ristolainen also took advantage of the powerplay registering five of his eight assists while Ryan O'Reilly collected six of his eight assists with the man advantage. However, of the two, only Ristolainen was able to light the lamp, and he did it only one time. Kyle Okposo, Sam Reinhart and Zach Bogosian also used the powerplay to their advantage while Evander Kane only scored one of his four goals with the man advantage. Here's your scoring leaders for the current Sabers only over the last two seasons on national TV. Buffalo had a trio of goalies in the spotlight beginning with Chad Johnson, who took over the starters role after No. 1 Robin Lehner went down with an injury in the second period of the season opener. Anders Nilsson backed up Lehner last season and started the first three games for Buffalo on NBC. He had a 1-0-2 record allowing 8 goals on 109 shots for a .926 Sv%. The Sabres hit the ice tonight with points in three of their last four games (2-1-1) after coming off of a four-game losing streak. They're still getting hit by the injury bug although Girgensons and defenseman Justin Falk skated with the team at today's game-day skate. Neither will probably play tonight and according to reports from the rink, head coach Phil Housley mixed up the lines and d-pairings a bit again. Benoit Pouliot at center is very interesting as the Reinhart experiment there seems to be losing steam. Lehner looks to get the nod in net for Buffalo and it was noted by John Vogl of the Buffalo News that Lehner went back to Vaughn equipment after starting out the season using Brian's. Hopefully as he's 1-3-1 this season with a bloated 3.29 GAA and a very sub-par .894 Sv%. Gametime is at 7:30 pm.